Everyone has to start somewhere. While this phrase might sound a bit cliche, it is 100% true. Every single person in this world who has ever decided to change their ways, improve their habits and live a healthier and more fit lifestyle has started at a completely different point than the other – guaranteed. So, for all of you out there who don’t know where to start and aren’t sure what the right training and eating plan is for you – you are in luck! If you are just starting to workout, your best bet is to find something that you are inclined to enjoy. If you hate being in a gym and feel incredibly intimidated around all of the people and intense machines – don’t go to the gym. There are plenty of ways to workout in the comfort of your home using your own body weight, or items you might find around your house like a chair or even a wall. Maybe you would rather get outside for your sweat session – do it! Ever feel like you want to punch someone (hey, it happens)? Sign up for a martial arts class or a cardio kick boxing class to blow off some steam. It might take a bit of trial and error to figure out exactly which type of exercise you enjoy, but you have to go for it! There’s no wrong type of workout – the only wrong one is the one that doesn’t happen. Don’t fall for the “Lose Weight Fast,” “Quick and Easy” or “Only 2 Minutes A Day” slogans. No, you don’t need blood, sweat and tears for 2 hours a day, but you do need to actually put in some concentrated time and effort if you want to see lasting results (and by effort I don’t mean getting the perfect angle during your fitness selfie). Eating healthy doesn’t have to be boring, and eating chicken & broccoli just isn’t going to last forever. No matter what type of healthy eating habits you decide to follow, you must ask yourself “Can I do it forever?” If the answer is “yes,” go for it! Just because paleo, gluten-free, vegan & South Beach Diet are all the craze – doesn’t mean it has to work for you. Some people do amazingly well with paleo style eating, while others not so much. There is no cookie cutter diet plan, you have to figure out what you like and what is manageable for your lifestyle and goals. Plus, social media is flooded with recipes, like this low-carb zucchini lasagna, to ensure that you never get bored with the same meals. Contrary to your workout plan, “quick” and “easy” are words you want to look for if cooking is not your forte. A great way to try new recipes, while not feeling isolated in your “diet land,” is to invite friends over for a healthy potluck where everyone brings their favorite healthy dish to share. My dad always told me that the 5 most important words are “Surround yourself with good people.” It took me a while to figure out what “good” meant – but then I realized it’s people who support you and those who are along for the ride (ups and downs) with you. 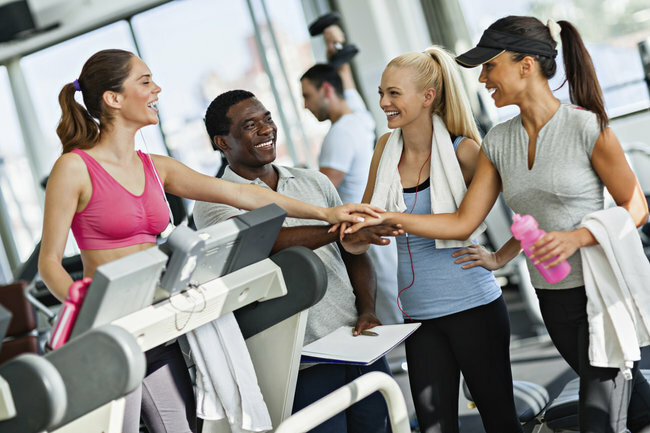 Perhaps you have a friend you can get to join you for a partner workout, or maybe you’ll meet a new friend in Spinning or Yoga class. Be open to the impact that surrounding yourself with like-minded people can have on your success. Remember, once you decide it’s time to change your lifestyle you’ve got to take action! Take the time to figure out what types of training you like and don’t like. Take the time to figure out what foods and style of eating you really enjoy. If you really take the time to figure out what works for you, this time will be the time for success.